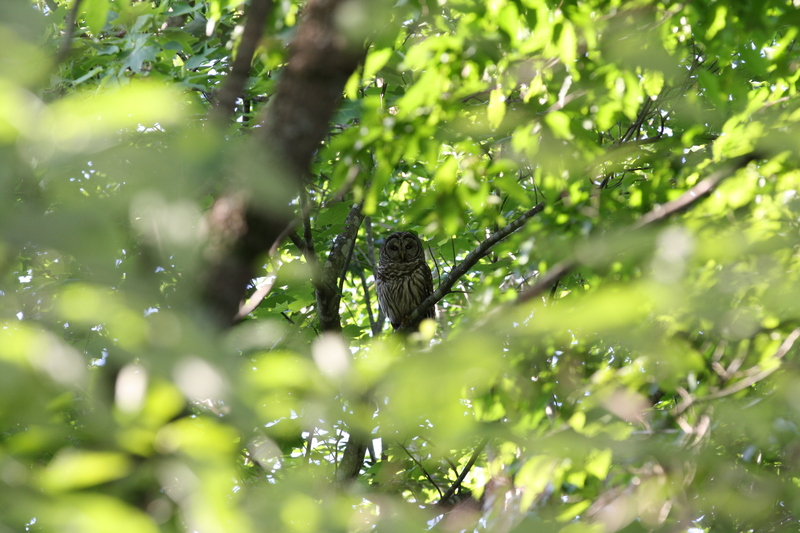 When we first moved into our present house seven years ago, we soon noticed that a pair of barred owls (strix varia) was roosting in one of the tall cedars toward the rear of our property. Spring came along, and one morning I sat down to breakfast in the dining room, sipping my coffee and waiting for wakefulness to dispel the sluggishness that was making my movements slow. I happened to glance up at one point, looking out through the sliding glass door onto the deck where, to my surprise, perched an immature barred owl on the railing. He was curious, staring in at me even as I stared out at him. We were separated only by the glass door and about eight feet of space. I was mesmerized. Eventually Hedwig, as my boys named him, flew off, as young owls of a certain age are want to do, but often I’ve spotted his parents since then, usually thanks to the local bird populace, which is quick to sound the alarm. Sitting on my deck, a chatter of alarm cries rises, and looking toward the sound, I spot an owl in the tree, looking calmly back at me. It happens again and again. One night this spring I closed the blinds to my son’s window, when–on an impulse–I reopened the blinds and looked out. There, perched on a tree limb, sat a baby owl, a puff of fluffy feathers with no hope yet of flying. I watched, amazed, as he called out to his mother, a plaintive sound that I now find unmistakable. As my boys gathered about me to enjoy the sight, the owlet turned and looked at us, momentarily ceasing his hungry cries. This was so much better than any movie, TV show, or computer game. 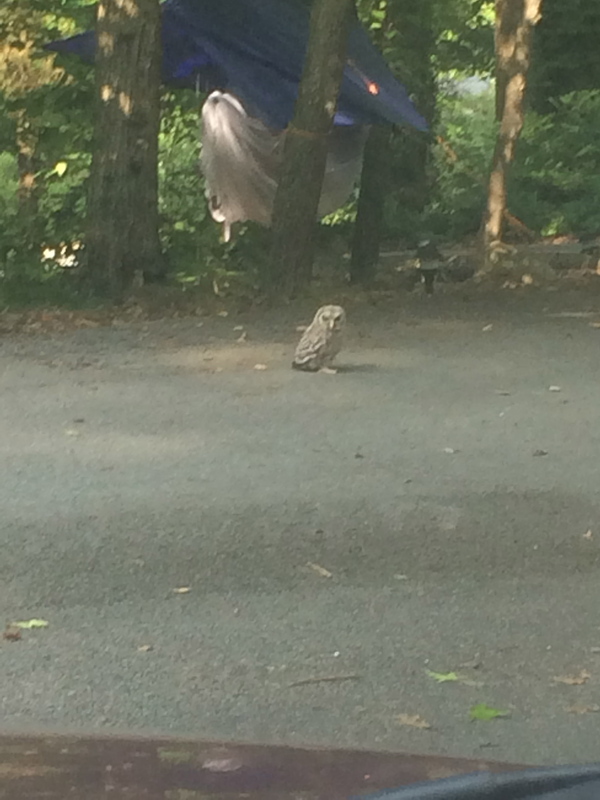 A day or two later, backing out of my driveway, my elder son called out, “Dad, it’s Puffle!” (for Puffle was the name the owlet acquired from my boys). Sure enough, there he was in the driveway, eyeing us uncertainly yet somehow defiantly, too. Puffle was not at ease on the ground, but he was not going to reveal that to us unless he had to. I snapped a shot with my phone through the windshield. I was amazed that Puffle could have gotten so far on his feet . . .
That night as I stood in the yard, watering plants, I heard Puffle cry out. It was a familiar sound by now, one that made me smile, for often I had followed the sound to find him on a branch, eyeing me with stoic calm. Yet suddenly, as his cry was diminishing, the unmistakable sound of a second owlet could be heard. Puffle and Piffle. So Puffle hadn’t gotten that far on foot; Piffle had. My smile grew even bigger. So we have owls about us. It is a lovely thing to hear them in the night, or to look up from getting the mail and spot one on a branch above me, tolerating my presence. 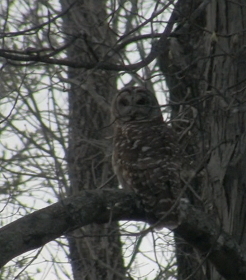 I’m glad they are barred owls; that means we get to see them in the day as well as at night. And my boys, of course, are thrilled, too. Nature has a way of blessing those who–to quote William Cullen Bryant–“hold communion with her visible forms,” and enjoying this family of owls and their offspring certainly has us feeling quite blessed.